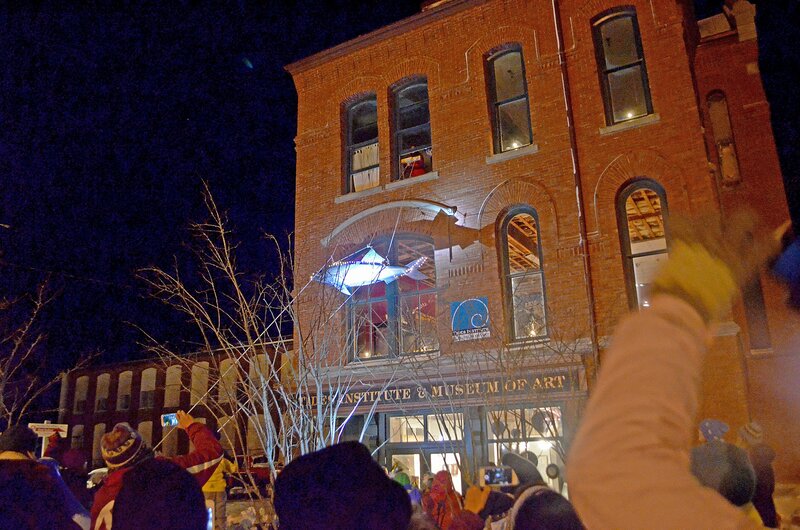 Join us for the 14th annual New Year’s Eve Great Sardine and Maple Leaf Drop in Bank Square, downtown Eastport. From the third story of the Tides Institute & Museum of Art, a giant red maple leaf will be lowered to commemorate the Canadian new year at midnight, Atlantic time (11 pm ET), while the New Year’s Eve Brass Band will play a rousing “O Canada,” (singing along is encouraged). At midnight Eastern time, an 8-foot sardine will take the plunge, as the brass band plays “Auld Lang Syne.” For family-friendly entertainment, The Minor Characters will be playing a mix of gypsy jazz, Argentine tangos, and other weird and inadvertent sounds on guitar, cello, violin, and accordion at StudioWorks from 9 pm until just before midnight. Don’t forget to kiss the sardine for luck in the year ahead! 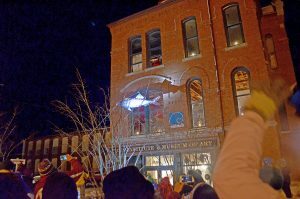 The Eastport New Year’s Eve celebration is organized and sponsored by the Tides Institute & Museum of Art; additional funding comes from The Dead River Company. See link below for the schedule of events and a list of local eateries, businesses and accommodations. Visit artsipelago.net/events/ for area events. 1-3 pm, TIDES INSTITUTE & MUSEUM OF ART — Family friendly open studio craft time to make party hats and noisemakers. Take your picture with the sardine and maple leaf, or use the photo booth with props. Open to all ages, free of charge. Donations welcome. 1-3 pm, TIDES INSTITUTE & MUSEUM OF ART — Museum store will be open. 1-4 pm, SWEETIES DOWNEAST — Celebrate the New Year with candy confections and chocolate cheer. Don’t forget your holiday fudge and Maine-themed treats. 1-6 pm, EASTPORT BREAKWATER GALLERY— End-of-the-year specials, hot cider and good cheer. 1-7 pm, SEASIDE STONES— Offering special festive hot beverage and after Christmas sale. Last day open until Spring. 3 pm-close, THE HAPPY CRAB— Serving food until 9 pm, with dinner specials. Dancing from 8:30 pm until close. 3-11 pm, EASTERN MAINE IMAGES— Stop in for hot cider and view photography by Don Dunbar. 3 pm-close, LANDMARK 1887 GRILL & ALE HOUSE— Dinner specials, by reservation or walk-in. Music with Lost Cat and the River City Rats at 8 pm. 6 pm-midnight, PORT O’ CALL—Hot Wassail (spiced cider) and refreshments. 7 and 9 pm, EASTPORT ARTS CENTER— Stage East presents: More Comedy on New Year’s. Showing at 7 & 9. Tickets available at Eastportartscenter.org. 6 pm-midnight, THE COMMONS—14th Annual New Year’s Eve Open House- 20% off entire store. Refreshments served from 9:00 pm until midnight. 9 pm-midnight, STUDIOWORKS— Family friendly dancing and music by The Minor Characters, photo booth with props, New Year’s-themed craft activities, and more. For all ages; children must be accompanied by an adult. Coffee, tea and light refreshments. 9 pm-midnight, TIDES INSTITUTE & MUSEUM OF ART— Coffee, tea, hot chocolate and light refreshments. 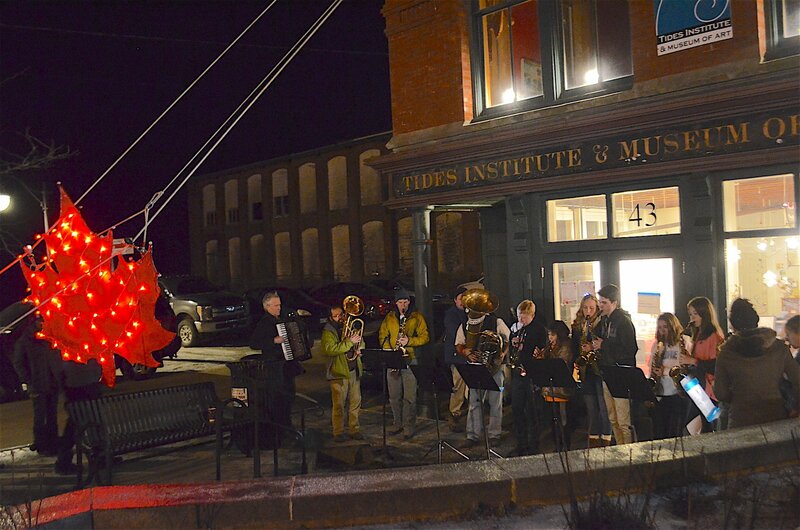 11 pm (midnight AT), TIDES INSTITUTE & MUSEUM OF ART—New Year’s Eve Maple Leaf Drop and ‘O Canada’ with the New Year’s Eve Brass Band, Bank Square. Midnight (ET), TIDES INSTITUTE & MUSEUM OF ART—New Year’s Eve Great Sardine Drop and ‘Auld Lang Syne’ with the New Year’s Eve Brass Band, Bank Square. SWEETIES DOWNEAST — 1-4 pm, offering a sweet selection of candies and chocolate treats. THE HAPPY CRAB— 3-9 pm serving food; special dinner menu, and dancing from 8:30 until close. LANDMARK 1887 GRILL & ALE HOUSE— 3 pm-close: dinner specials, by reservation or walk-in, live band. WACO DINER—6 am-2 pm and 5-9 pm (special menu); after midnight: steak & eggs, omelets, etc. W H E R E T O G O? W H A T T O D O?